Ever since the Wright brothers flew at Kitty Hawk, North Carolina has proudly proclaimed to be “first in flight.” Less well-known is Carolina’s connection to deep space — from the first astronomical observatory on a college campus, to the first planetarium in the South, to one of the first administrators at NASA, UNC scientists have long been connected to and inspired by the night sky. Captain James Lovell, a NASA astronaut who was navigator on the Apollo 8 mission and commander of Apollo 13, trained at Morehead Planetarium and Science Center in the mid-1960s. In the fall of 2018, when the James Webb Space Telescope launches to an orbit four times farther away than the Moon, it will have an unprecedented ability to see distant events and objects in the universe. Six times larger than the Hubble Space Telescope, Webb will be able to detect remnants of the earliest stars and galaxies, and answer fundamental questions about how our world formed. The namesake for the most powerful telescope ever developed, James Webb graduated from UNC in 1928 and went on to become the second administrator at NASA. He served from the beginning of the Kennedy administration through the end of the Johnson administration, overseeing all the critical first manned launches until just before the first astronaut-led Apollo flight. But Webb is not the only Tar Heel connected to NASA or deep space exploration. Since the university opened its doors, Carolina scientists have been posing questions — and finding answers — in the stars. In the early 19th century, back when Franklin Street was a dirt road, and UNC’s enrollment totaled just a few dozen students — a man ahead of his time helped shape the culture of learning here. Joseph Caldwell, the university’s first president, was a mathematician and Presbyterian minister, and he was also an astronomy buff who saw great physical and philosophical value in looking toward the sky. When he asked for university funds to purchase astronomical tools, though, his requests fell on deaf ears. Undeterred, Caldwell used his own money to travel to Europe and came back with several thousand dollars’ worth of scientific materials for the university, including a handful of telescopes. In 1830, he constructed an observatory in the backyard of his house — the first one in the United States intended solely for educational purposes. Despite this promising foundation, it would be another 150 years before the study of astronomy became an official major at UNC. Chris Clemens, senior associate dean for natural sciences in the College of Arts & Sciences, attributes that to the deadliest conflict in our nation’s history. The original telescopes that Caldwell purchased from France in 1824 are still on campus today — on display at UNC’s Morehead Planetarium and Science Center. Roughly 100 years after Caldwell built his observatory, John Motley Morehead, III met with UNC’s then-president Frank Porter Graham. The two men chatted about Morehead’s illustrious career in chemistry. Shortly after graduating from UNC, he helped uncover an economical process for manufacturing calcium carbide — a discovery that made him very wealthy. Morehead attributed his success to UNC, and wanted to find a way to give back to his alma mater. In addition to endowing the John Motley Morehead Foundation to provide financial assistance to UNC students, Morehead wanted to inspire young North Carolinians to explore the world of science. He and Graham discussed different possibilities, and ultimately decided on a planetarium. When it first opened in 1949, Morehead Planetarium was unprecedented. It was only the sixth planetarium to be built in the United States, the first one in the South, and the first one on a university campus. The planetarium not only fulfilled Morehead’s wish of inspiring young people to engage with science — it also served as a training center for professional space explorers. From 1960 to 1975, over 60 NASA astronauts including Neil Armstrong and John Glenn came to Morehead Planetarium to study celestial navigation — a critical skill in the event that automatic navigation systems failed while they were in space. The training saved lives on three occasions — during the Mercury Atlas 9 mission, Apollo 12, and Apollo 13, according to Todd Boyette, the current director of Morehead Planetarium. To this day, it remains the only planetarium in the world to train astronauts in celestial navigation. As NASA astronauts were honing their skills at Morehead Planetarium, and the country became more engaged with the international space race, UNC’s Department of Physics started recruiting new faculty like Morris Davis, who arrived from Yale in the early 1970’s to become Carolina’s first official astronomer. Wayne Christiansen and Bruce Carney joined the faculty just a few years later. They advocated for adding “astronomy” to the department’s title, and started an official astronomy major. By 1985, the Department of Physics and Astronomy was on the forefront of astronomical study, boasting a brand-new $45,000 “super-microcomputer” with extensive memory and operations capabilities. The SUN 2-170 system included a 2-MB, 32-bit processing unit, a tape drive, and a 130-MB hard disk — a fraction of the operating power of a standard smart phone today. Radio technology and radio telescopes were also considered cutting-edge in 1985. Christiansen would travel to the middle of the desert, 120 miles southwest of Albuquerque, New Mexico, to spend time peering through the most sophisticated radio telescope at the time — the Very Large Array (VLA). With it, he was able to observe quasars — extremely remote celestial objects — several billion light years away. But getting time on the VLA was a challenge. Christiansen and Carney wanted a telescope that UNC could claim as its own — a massive undertaking that would come to fruition 20 years later. 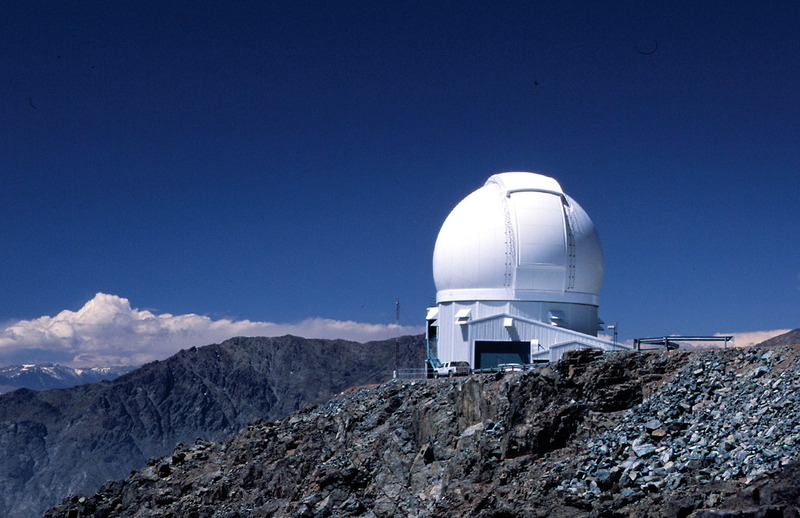 The SOAR telescope observatory sits at an altitude of 8,775 feet in the Chilean Andes. 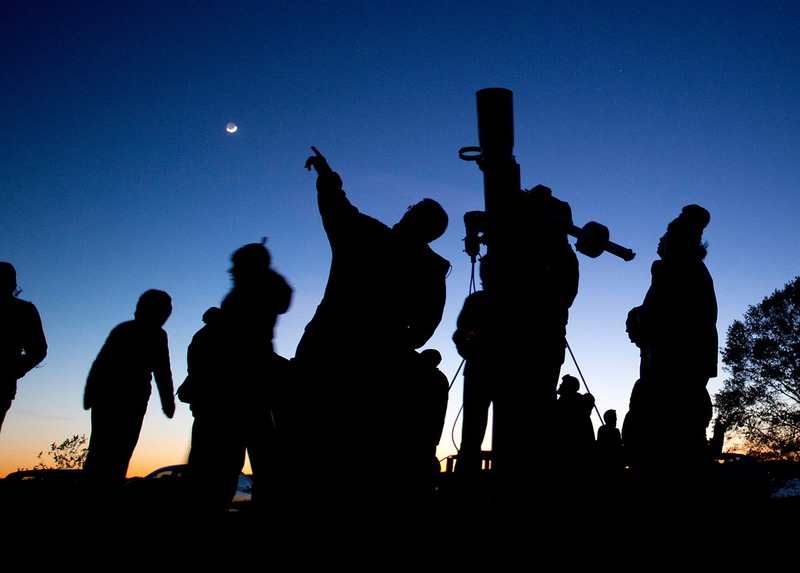 SOAR is among the foremost research facilities available to astronomers in the southern hemisphere. In the Andes mountain range of central Chile is a small peak called Cerro Pachón. Rising almost 9,000 feet above sea level, the mountain is home to some of the driest conditions — and clearest air — on Earth. It is the perfect place to observe the night sky. There are only a handful of 4-meter telescopes in the world, and one of them came to be on this mountain in 2004 thanks to a $32 million public-private partnership among the U.S. National Optical Astronomy Observatory (NOAO), the Ministry of Science of Brazil, Michigan State University, and UNC. The Southern Astrophysical Research telescope (SOAR) boasts first-rate optics but its true innovation lies in its adjustability. Other 4-meter telescopes have equipment that weighs thousands of pounds and can take an entire day to change. The “quick change” instruments on SOAR, though, allow astronomers to measure the mass and temperature of a white dwarf star, or capture two binary stars orbiting each other. Roughly 5,000 miles away, new technology and new instrumentation for SOAR is developed in the Goodman Laboratory for Astronomical Instrumentation on UNC’s campus, where students have the ability to observe these phenomena in real time. On a sunny afternoon in early February, J.J. Hermes, a Hubble Fellow in the Department of Physics and Astronomy, sits in a room with no windows on the ground floor of Chapman Hall. “This is sort of the front line where the data is coming in — in real time,” he says. Astronomers from UNC spend roughly 60 nights a year observing from this room, remotely controlling instruments more than 4,500 miles away in Chile. But their astronomical laboratories are truly remote: The nearest stars UNC researchers observe are still several light years away, tens of trillions of miles from Earth. SOAR is one of the most efficient telescopes at capturing blue, near-ultraviolet light, which is often produced from very hot stars. On this February evening, Hermes and collaborators were using SOAR to measure the mass and temperature of stars at the end of their life cycle, white dwarfs, which have surface temperatures more than twice as hot as the Sun. Each month, Morehead Planetarium educators and Chapel Hill Astronomical and Observational Society members lead guided observations of stars, planets, moons, nebulae, and other celestial objects. While Chris Clemens and many UNC students study blue light across the universe, other researchers who use SOAR wanted to replace the blue camera with one that would better study cooler, redder objects — but this would reduce capabilities in the blue and ultraviolet. To compromise, Clemens suggested they add a red camera to the Goodman Spectrograph. The instrument, though, was not designed to host two cameras. “So I got a grad student and an undergrad, and I helped them define what they were going to do,” Clemens says. They didn’t need to build a whole new camera from scratch — they needed to engineer a new optical interchange on the existing instrument that would allow them to permanently attach a second camera without interfering with any of the existing capabilities. The graduate student, Erik Dennihy, supervised the undergraduate, Stephen Fanale, to write the software and conduct finite element engineering analysis. Clemens built the Goodman spectrograph for SOAR in the early 2000s. An undergraduate helped design the entire software control system for the spectrograph. Dan Reichert built the PROMPT network — small telescopes pointing toward explosive events in the sky that are detected by orbiting X-ray and gamma-ray satellites. Nicholas Law built the EVERYSCOPE in Chile. “Everyone who has come to our department has built this, or built that. 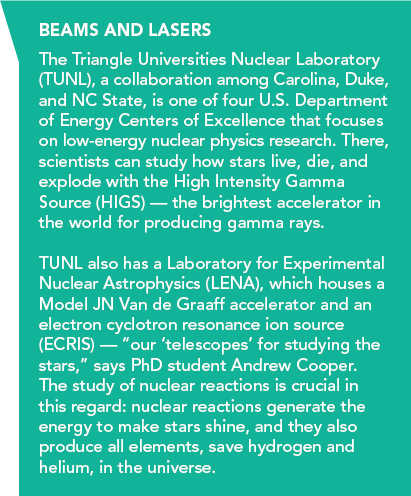 So we hire people now who are known for building interesting stuff.” As senior associate dean of natural sciences, and former chair of the Department of Physics and Astronomy, Clemens hopes to see UNC gain international recognition in the coming years for our astronomy prowess and unique astrophysics. Chris Clemens is the senior associate dean for natural sciences within the UNC College of Arts and Sciences and the Distinguished Professor of Physics and Astronomy. Wayne Christiansen is an emeritus professor within the Department of Physics and Astronomy in the UNC College of Arts and Sciences. Bruce Carney is an emeritus professor with the Department of Physics and Astronomy in the UNC College of Arts and Sciences. He is also a former UNC executive vice chancellor and provost. Todd Boyette is the director of the Morehead Planetarium and Science Center, as well as president of the Association of Science Museum Directors. J.J. Hermes is a postdoctoral fellow in the Department of Physics and Astronomy within the UNC College of Arts and Sciences. This entry was posted in Earth, Time and Tenacity. Bookmark the permalink.